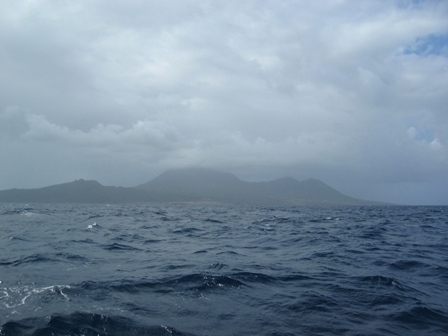 We left Falmouth Harbor at 0700 and sailed directly downwind with the jib poled out to the island of Nevis. Ed and Julie also left the same day, but left earlier, and were waiting for us. After a long 10 hours we finally were all settled in with the anchor securely set off Pinney Beach. 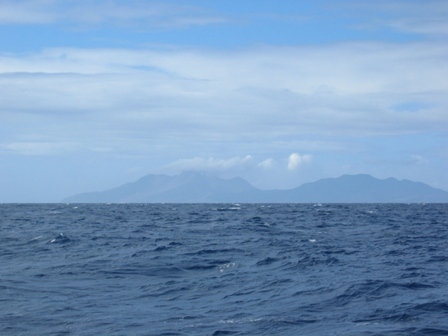 During the sail to Nevis from Antigua we passed the island of Montserrat. Geologists have found that the lava cap has been expanding and there are concerns of a possible eruption in the near future. With the increased release of ash lately coming from the volcano, flights as far away as Puerto Rico have been canceled. Here you can see the steam coming from Galways's Soufriere (volcano) on the right side of the picture. 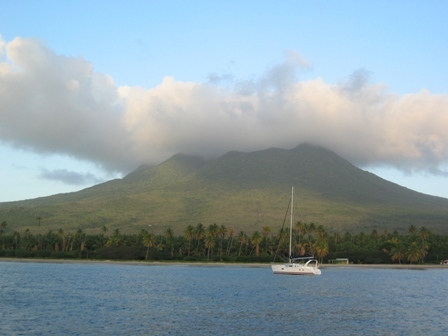 Nevis was called Oualie by the Amerindians but when Columbus came in 1493 he called it Las Nieves, the snowy ones, because the clouds surrounding Nevis Peak looked like snow. In 1628 several English colonists from the nearby island of St. Kitts founded the town Jamestown on Nevis. In 1673, Nevis became the administrative center of the British Leeward Islands, and it also became the center of the slave trade for the region. 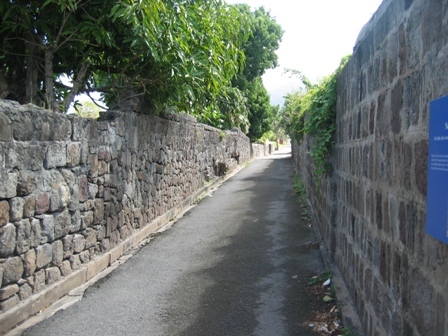 Between 1674 and 1689, approximately 7,000 slaves were brought to Nevis to be sold. Outside the town of Charlestown, one block from the pier, there was an alley and a small ruined stoned building that was the site of the public market place where the slaves were sold. When we saw it, I got such a strange feeling. I can't even begin to imagine the fear and loss that these people must have felt in this unimaginable dehumanizing practice. In 1680 the settlement of Jamestown was destroyed in an earthquake and disappeared under the sea. Charlestown was later built to replace Jamestown and continues to be the capital today with a population of approximately 2000 people. 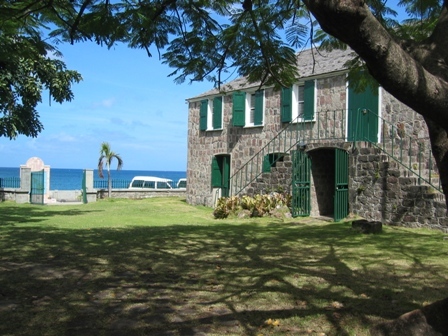 During the 18th century Nevis became a very prosperous island with many plantations with fine houses, so much so that it was called the, "Queen of the Caribbean". 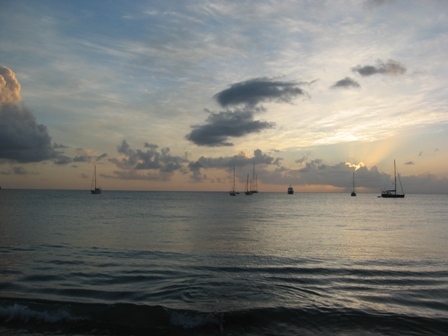 During this time Nevis was also known, as far away as Europe, for its hot springs, . These hot springs were thought to bring good health and a spa hotel was founded in 1778 that catered to the rich from overseas. Today very little survives of the hotel but some of the plantations have been restored and now cater to the rich from all over the world. Nevis remained under British control until 1983 when it received independence and formed a federation with with the nearby island St. Kitts. St. Paul's Anglican Church and School. St. Paul's was one of five early churches built to serve the Anglican English settlers. This church was established between 1680 and 1700 and served the residents of the area. The area was then called the "Red Storehouse" and was later named Charlestown. In 1812, Daniel Davis, the son of a local planter, was appointed rector of the church. He was actually born in St. Kitts and educated at Oxford. 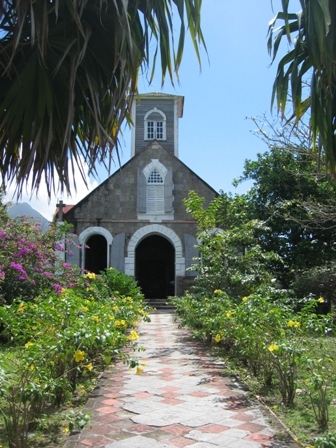 Arriving on Nevis, Davis was convinced that slavery was wrong and once appointed he immediately began a Sunday school and day school for teaching Christianity to the slaves in the church school next door to the church. Inside the church there are tombs dating from 1702. This present church structure was built in 1712. On March 24th, 1607, 144 Englishmen landed here on Nevis. These same Englishmen on May 13th 1607, founded what we now know as Jamestown, Virginia, the first permanent settlement beyond the British Isles. This is also the house that on January 11th, 1757, Alexander Hamilton, was born in. Marco and I planned to hike to the top of Nevis Peak the next day but when we went to get into the dingy we noticed that it was deflated on one side and upside down with the motor submerged in the sea. During the night the dingy apparently was stuck under the wind vane causing a four inch tear in the bow. It took most of the day for Marco to clean and dry out the engine and for me to patch the slash in the dingy. Unfortunately we were never able to explore the peak. 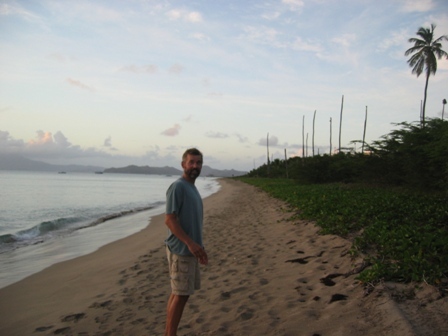 Despite this mishap, we still really enjoyed our short time on Nevis. 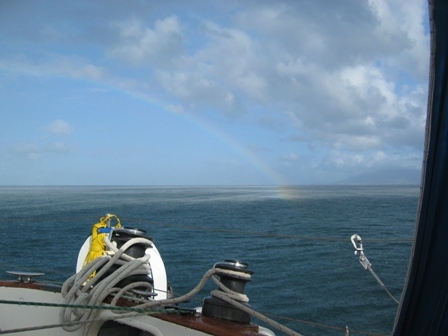 While at anchor in Gallows bay a rainbow formed next to Dalliance. We always knew that we would find the pot of gold!!! Marco on Pinney Beach going for a sunset stroll, yes it was romantic!!! Sunset over the anchor field taken from Pinney Beach.